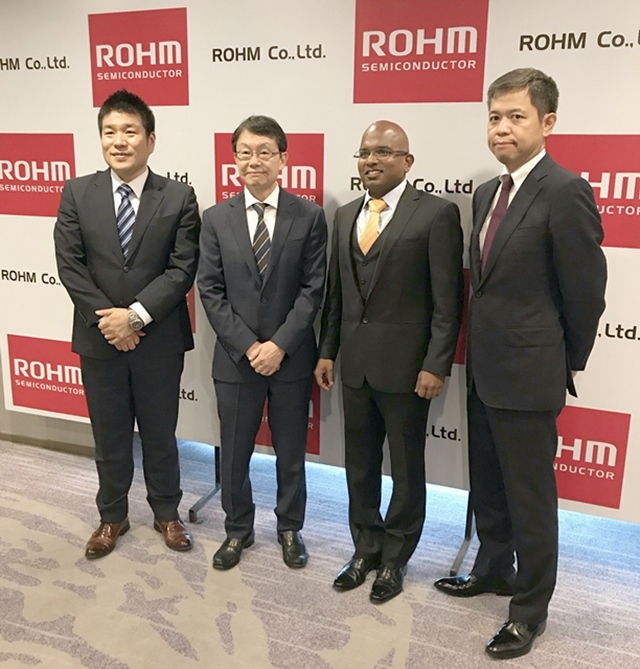 ROHM, a Japan based semiconductor solution provider has for the first time introduced ‘Panel Chipset solutions in the Indian market to bring in safety function to Next-generation Auto motives including Two wheelers . The chipset has been designed to drive and control automotive LCDs, including larger high resolution monitors used for navigation and the instrument cluster. The expanded line-up is compatible with functional safety measures for speedometers, side mirrors, and other vehicle systems. The increased use of LCD panels in next generation vehicles for the instrument cluster, navigation, electronic mirrors, and other systems, with larger, higher resolution displays, calls for an increase in the number of driver and controller channels. This makes system configuration and operation verification more difficult, favouring chipset solutions. In applications such as electronic mirrors, malfunctions can lead to serious accidents and functional safety is required. ROHM is providing energy efficient power and safety solutions for automobile and has recently developed a chipset designed to drive and control automotive LCDs, including larger high-resolution monitors used for navigation and the instrument cluster. ROHM’s revenues from this Panel-chipset solution is projected to hit US$100 million by 2021, with a CAGR of 13% with present US$60 million. “The automotive industry in India is one of the prime drivers of the Indian economy. This industry’s R&D is an integral part of enabling manufacturing and innovations in India. ROHM introduces the latest technology in Panel-Safety which had huge market success in Europe and Japan. ROHM is convinced that this new automotive Panel-Chipset is necessary for the Indian market as it will enhance both safety and comfort.” said Daisuke Nakamura, Managing Director, ROHM Semiconductor India. “ROHM Semiconductor India is working towards enabling innovations in the Indian two-wheeler market. We are now working with key Indian two-wheeler OEM and Tier1, to customize this solution for the Indian market. A fully functional digital LCD panel can display much more useful information than the mechanical and semi-digital panels. We are working very closely with both conventional OEM’s and for e-bikes to define the application in India.” said Britto Edward Victor, Head, Design Center, ROHM Semiconductor India. With the advent of the Smartphone, LCD panels are now the de facto user-interface. This fundamental innovation has brought some major advantages and the users are accustomed to using this interface. And, in recent years the adoption of LCDs in vehicles for the instrument cluster/meter, navigation, electronic-mirrors, and other systems have risen significantly, while the growing number of applications has increased the demand for larger and higher resolution displays. Unlike consumer-displays which may sometimes freeze, automotive-panel displays vital information to the driver relating to vehicle parameters (Speed, Engine-conditions, Turn-indicators, etc.,), and images from cameras (rear-camera, side-mirror cameras, etc.,) whose malfunction leads directly to human-safety on the roads. To achieve these high-safety needs, it is necessary to increase the number of LCD-driver and controller channels. However, this makes system configuration and verification complex, strengthening the demand for an integrated Panel chipset solution. In addition to this, applications like electronic-mirrors where malfunctions can lead to serious accidents functional safety are required. ROHM’s new Panel chipset integrate a gamma correction IC, timing controller (T-CON), source driver, and gate driver for driving HD/FHD class displays (the highest resolution currently on the market), along with a power management IC (PMIC) to ensure optimum operation. Each IC is designed to share information as needed, for the supporting functional safety in devices of displays. This chipset ensures high reliability for LCD monitors used for side mirrors and speedometers. In addition, chipset optimization allowed ROHM to cover a wide range of specifications while at the same time integrate a key Fail detection function in the timing controller to verify operation, making it possible to configure high-resolution LCD panels. Each IC configured in the chipset integrates a function for detecting the expected failure mode. As a result, it is possible to detect panel failure and confirm and provide feedback on information such as input signals to the LCD as well as peeling/destruction of the LCD driver. Supporting functional safety contributes to the prevention of serious accidents caused by the malfunction of monitors for the speedometer, side mirrors, and other systems. For example, the driver may not notice that the screen for the side mirrors has frozen in the case no object is detected at the time, presenting a danger that can lead to serious injury if someone suddenly were to go behind the car while the car is moving. To prevent this ROHM delivers functional safety that can detect if the screen is frozen. ROHM chipsets are designed to cover a wide range of specifications, making it possible to easily configure high-resolution HD/FHD class LCDs. In addition, the timing controller is equipped with a Fail detection circuit for verifying chipset operation. And the setting of each output in the power management IC can be changed by simply rewriting the internal register value. This reduces development resources while contributing to common board designs. Functional safety includes safety measures (concepts for ensuring safety) that minimize risk by adding functionality such as monitoring and protective equipment. In the automotive market, functional safety minimizes risk to an acceptable level in order to prevent bodily injury in the event of malfunction due electronic system failure. There is even an international standard for automotive functional safety (ISO26262). Meanwhile, protection functions frequently referred to in ICs are functions that ensure the safety of the IC itself by monitoring for internal malfunctions and damage. ROHM Co., Ltd. (ROHM Semiconductor, ROHM), established in 1958, is a leading manufacturer of semiconductor and electronic parts. In addition to ICs, discrete semiconductors, and passive components, ROHM supplies optimized system solutions for a variety of markets from consumer and communication to the automotive and industrial sectors through a global sales and development network. Headquartered in Kyoto, Japan, ROHM has over 21,308 employees worldwide with consolidated sales of 352 billion yen in FY2017. For more information, please visit http://www.rohm.com/web/in/. ABOUT ROHM Semiconductor India Pvt Ltd.
ROHM Semiconductor India Pvt Ltd. (RSI) was established in 2011 as a sales subsidiary of ROHM in India. RSI currently has bases in Bangalore, Chennai, Pune, and New Delhi. In 2014 a design center was opened in Bangalore to provide local development support and propose reference designs.